Have you ever been written about? It’s the oddest sensation to find yourself in the pages of someone else’s story. 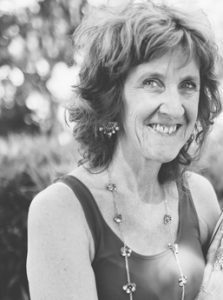 My friend Carrie Tiffany – I mention her by name because she is a writer and has published a story and therefore presumably does not need to remain anonymous, as so many others do – has written a story in which she includes a brief description of a time we spent together several years ago now. It’s a sympathetic portrait and there’s nothing in it to feel ashamed about. Carrie had mentioned it to me even as she was writing the story out of concern for my sensitivities. The vignette is merely a side tributary on the river of this wonderful story, which is well worth reading. Many years ago when I discussed some of my concerns about writing about my siblings and how they might feel, my then writing teacher asked if I’d ever been written about. As if I could only judge the experience through my own experience. It’s the oddest sensation. That’s me there on the page, the ‘Liz’ a peripheral character, who in Carrie’s story spells her name with ‘z’ and not an ‘s’, that’s me, and yet it’s not me at all. I’ve been fictionalised. It’s a me from the past, snap frozen in time, a tiny cameo of my husband and me, one winters day, I say winter because if it was written six months after my husband’s heart attack, then it must have been the wintertime, but it could just have easily happened in the summer. I write about this experience here now because I am pondering the issue of finding yourself described in someone else’s pages and how unsettling this can be, however much we know it to be fictionalised. I’m also wondering about the degree to which all creative writing however much it is described as non-fiction and allegedly therefore based on the so-called truth is in fact a fiction. The minor characters, Liz and Bob, in Carrie’s story are fictional characters however much based on real life characters. We know this and yet we tend to argue in polarities. Either it’s true – non-fiction, or it’s not – and therefore its fiction. It can’t be both, and yet it is both. And here I intersperse a photo break, a poorly captured image of my husband and me on our wedding day, to add to Carrie’s image of Liz and Bob well before any of this happened. I enjoy featuring in Carrie’s story because it gives me a different perspective of myself. Is that how I look/looked to her then. She ascribes such kind motives to me. It’s true I had wanted to reassure her in some way about her heart, as I believe had my husband, but I think I am not as benign as Carrie’s Liz comes across. Even the fact that I write about this now makes me wonder whether it’s not a sort of retaliation. You write about me and I’ll write about you. But now I write about a real person who is also a fictional character and quake inside because Carrie reads my blog. I’m giving a talk in a couple of weeks on the topic of ‘Auto/biography’: an excess of fiction or in excess of it? As chance would have it, and chance/serendipity is such a wonderful companion, my copy of William Michaelian’s, A Listening Thing, arrived during the week. So William too writes about a fictional character, Stephen Monroe, who is also himself, the author and narrator, William Michaelian, but at the same time not himself. If this stuff ties you up in knots I’m not surprised. I find myself twisting over myself in trying to find a way of describing something that seems so intangible. When someone writes about you, they use their own words, their own impressions. They look at you from the outside, whereas you can only see yourself from the inside. You can only imagine how you might come across. When I read about myself on the page, it’s like looking into one of those distorted mirrors you find at a circus. There’s one in the children’s section at the Melbourne Museum. I went there during the week with my grandson and we looked at ourselves reflected there. Three mirrors flowed down the wall, the one flat, the other convex, and the third concave. In the two distorted mirrors we saw ourselves, stunted and deformed, too tall in the neck, too short in the torso, and as we giggled and danced in front of our images, they became even more deformed. We came back three times. To be able to contort our self image into so many odd shapes and sizes gave us great pleasure, the same pleasure I find when I or someone else uses my form and tries to shape me into something that is not quite how I see myself from the inside. But even myself inside feels like that person in the mirror, too long here, too wide there, a leery grin here, eyes too big in my head there, a caricature of myself, whoever she is, in all her many manifestations. I came into the kitchen just now, early morning and no one else is awake as yet, and found one of the cats chewing on the remains of what looked to be a mouse. I approached with the intention of retrieving the mouse. For some reason I do not enjoy the sight or sound of a cat munching on mice bones. The cat let our a low growl. He wasn’t giving up his prey so easily. In the end I left him to it, but wondered why with full bowls of perfectly produced shop bought cat food, the stuff the cats generally prefer, the stuff that comes in tins from the supermarket, should this cat prefer his own caught mouse, disgusting bones and all? I’m not a cat. I cannot say, but perhaps it’s the same as in the writing process. We land on something and cannot let it go. We gnaw away at it or it gnaws away at us and will not let us be. Have you ever been written about? How was it for you? Disarming, disturbing, delightful? Or something else altogether? Anything’s possible. I don't think I have been written about – except in a couple of lines, but would imagine that it could be disturbing and also distressing. As you said, we can only see ourselves from the inside and others can only see us from the outside and I suspect they rarely match very well and are never identical. Something to go away and think about. Thank you. I don’t think anyone has ever had me in mind, but there are so many stories I’ve read and thought how spooky it was to be described so accurately, usually pointing out faults I didn’t admit until seeing them on the page. We rarely see the good stuff. It’s the obvious limitations so accurately described that highlight the page. Enjoyed the read. The wedding must have been in the seventies. 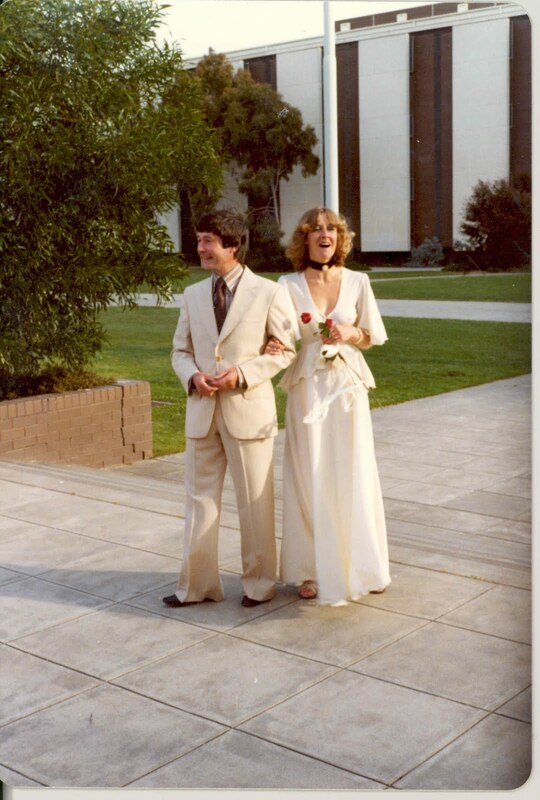 I had the white suit with bell bottoms at mine too. Your wedding picture is so lovely, it looks simple, fun and easy.and sweet. Is it really in the 70s? Because of the choker. I always wanted to wear it when I grow up. I could not write about my husband because he is not hear to correct it. I could write about my children because I know they would come complaining if it is something they are not happy about. I've been written about only once, that was when my mother had the local paper write an article about my wedding on their social page. I didn't even know she'd done it until someone pointed it out to me. The real truths about ourselves are locked up inside our mortal shells and protected by personal barriers or masks to keep our soul pure :-). Don't know that anyone's ever written about me—except maybe on a poetry critique board when I was being publicly flogged for my lack of conformity to the unspoken rules of the establishment. But you're not talking about gossip, I don't think. So if I've ever genuinely been written about, I have no knowledge of it. The inside and the outside views are often very different, Elephant's Child, as you suggest. It's so easy to take offense at the written word. People do it all the time, take offense at those words on the page when there is no modifying tone of voice or facial expression to soften the meaning. Oh dear, Elizabeth – now that would be something, a husband who's a writer. It could well make for a lot of agonizing over whether or not you feature. And even if you don't find yourself in his writing then there are all those others who might find you, whether or not it's you in there. I presume its good for you those days are over. That said, I wonder that my husband puts up with my writing, sometimes, not just the fact of it but also the content. The wedding was in '77, Anthony. My husband calls it his ice-cream suit, all the rage at the time, as you'd know, but these days our daughters laugh themselves silly at the sight. And yes, I agree, we tend to see all the negatives in writing, especially when it comes to recognising aspects of ourselves, well before we notice the positives. The choker, Fazlisa, is lovely. I no longer have the brown velvet ribbon from around my throat but the ebony rose which I sewed onto the centre of the ribbon is still with me, buried somewhere among my memorabilia. It was a lovely wedding as I recall, especially the reception, and yes it was during the seventies, that strange decade between the hippy years and the halcyon days of the eighties. And when that someone pointed out the article on your wedding that your mother put in the local paper, River, did you cringe, did it read as heavily fictionalised or did it make your heart swell with pleasure and pride? As I said in my post, anything's possible. Ah , Who, you've missed out on quite an experience if no one's written about you, not even in the blogosphere? I think we not only tend to see all the negatives in writing but also in photographs. 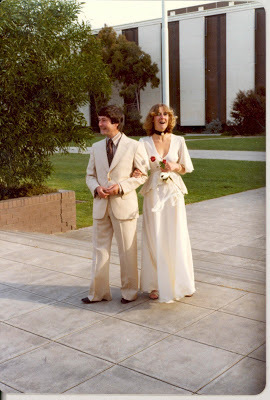 Love your wedding picture, mine dates from 78.. no ice-cream suits a year later. I'm not sure about keeping our souls 'pure', Windsmoke, unless of course you mean the expression symbolically, but I certainly agree that we keep most of the so-called personal truths about ourselves locked away inside. It helps to share some of them with helpful and responsive others sometimes, at least the stuff we know about. I suspect there's also a great deal locked away inside of us that even we don't know about, which others might see more clearly than we. You're right, Art, I wasn't thinking so much about gossip as about being written about in some literary form, though I suspect the same principles might apply. In situations of gossip our emotional temperature might be far higher, than when we find ourselves written about in some ostensibly disguised form in someone's else's so called fiction. And of course, there's the disappointment a child might feel when she discovers she barely rates a mention in her mother's or father's memoir. As Carol Steedman argues, children are rarely more than bit players in their parents' autobiographies. No ice cream suits in 1978, Anni in Belgium? My goodness how quickly fashions change. It's not a great photo but it gives a flavour, some sort of flavour at least, of the day and of that couple who were wed all those years ago. I am not sure we really know ourselves, Elizabeth, let alone anyone else. We all have so many different faces and moods. As far as I know I have never been written about other than the odd comment in blogland. I can't help feeling that if the comments one read about oneself were flattering then we would judge them to be accurate – and if unflattering we would judge the writer to not know us well. (sorry the spelling is not accurate but I can't find my quotation book – but you get the sense of it). Yes, but you’d never know it. When my daughter first came to live with us Carrie and I had only been married a few months and were still finding our feet and then suddenly there was this other woman – okay, a young woman (she was seventeen at the time) – who was now the main focus of my attention. It really was bad timing. Now we would have no problems with a third party floating around the flat but back then it did put some small strain on the relationship and that came out in one of Carrie’s best pieces. I forget the title but I think of it simply as ‘the Griffin story’ because that’s what the story is about, a family of Griffins; it’s quite a lovely piece. And, of course, you will find me in a number of Carrie’s poems but, again, I’m unrecognisable. Her poem ‘A Room Called House’ is about me. My parents’ house had two rooms downstairs, the family room in which we congregated of an evening and watched TV and the front room which, until I took it over in my early teens and made it my office, was kept for entertaining guests. The family room was referred to as ‘the house’ and it was generally understood amongst my family that if someone said that Dad was in the house he was in that room as opposed to somewhere in the building. Of course when Carrie arrived here she had a thousand questions about me and my past but, typical me, I wasn’t much interested in talking about it. The room was called ‘the house’ because that’s what we called it; stools were ‘buffets’ (pronounced buff-et, not boof-ay), the mantelpiece was ‘the cornish’ and who cared why. Carrie tends I think to romanticise my childhood – my fault I’m sure because I’ve been quite selective in my recollections only telling her what I felt was critical – and I’m sure it was far less miserable than she imagines but the fact is that I did isolate myself in the front room from my family for years and not just my family, the world outside. I recall once going out to the street and someone, one of my peers, said, “Oh, here comes the recluse,” which was a bit of a wakeup call because I really didn’t consider myself a recluse, simply solitudinous by nature. Now I don’t have to interact with people as much I have to say that aspect of my character is definitely coming to the fore again. I’m sure that ‘Sins of the Father’ is about me, ‘External Verification’ (when I was an assessor we used to get in external verifiers to check our work), ‘Tryst’ and ‘Help! I’m being held captive in a shortbread tin’ is not so much about me as the culture shock she experienced on first arriving in the UK when both of us were desperately trying to hang onto our identities. At the end of the day though they are poems and you can’t trust them. The police wrote about me and then claimed I'd said it (dictated it to them). Then they demanded I sign it (author! author!). I refused. They thumped me and threatened to hurl me out the window. I still wouldn't sign. So they brandished the confession in court anyway and swore on the bible that it was my work. What liars. It was not my work. They got my character wrong, that was their blunder, put words like "yeah" in my mouth. I'd have replied "yes". But when asked if I dealt in stolen property I wouldn't say yeah or yes. The older I get, the less sure I am of what is true. I think that in a sense that everyone is re-writing history constantly. Thereby changing their own and other characters to a shape they find more bearable,or understandable. That being said, I have been written about by others from time to time and find it to be deeply disconcerting because it always shows the deep chasm between my view of things and someone else's. What an interesting post. Much to reflect on. If you get into Imaginal Psychology (which is Jung's Archetypal Psychology in a slightly rejuvenated model) then imagination is as real as 'reality'. Also, as reality is a projection anyway, then all portraits, fictions and non-fictions, are in some way reflective of the artist or writer. My thesis is all about this stuff. The only things written about me have been objective and factual (some may say boring) accounts of my filmmaking avocation/profession. Certainly nothing which would raise an eyebrow or elicit the desire for retaliation. By the way, it is known that even well fed domestic cats will hunt and eat prey even when they are not hungry. Domesticated as they may be, there remains a vestage of their ancestral feline predatory behavior nestled deeply in their kitty brain. Your cat needed that mouse most certainly to remind him/her of what it really is. i think every story we have, even our realities, our histories, both are and are not fiction. it is through us they are known. they are supersaturated in precise egos. there is no other way. and so when someone else knows us, writes of us, we are new. imagine! the (dangerous) opportunity to be born over and over again. I've been interviewed a couple of times, but that was easy enough to manipulate so that the answers given showed me in the right light (ie to promote my book, council project etc). I shudder to think of how someone could portray me using their own perceptions, words and meanings…. elisabeth, i lived with a writer for a year, in a passionate and exhausting relationship. years later i discovered he had included me and my son in a novel he wrote. he is a brilliant writer; it was not a pretty picture; but it had the gravitas of his authentic emotional involvement in our relationship, and for that, oddly, i was profoundly grateful. i made a powerful, visceral collage using his language about me, combined with images from the book The Silent Twins, by marjorie wallace (an account that haunted me). Thank you so much for your visit, Elisabeth. I can't say I've been written about at length by anyone… and maybe that's a good thing. I'm just trying to get my life organized right now. Too much going on. We're looking forward to our lives returning to some normalcy in about a week. Sigh…. I suspect you're right in this, Pat. When people see us in a positive light we are more likely to take the view that they have an accurate perception of us. Though I also think that when people flatter us, we can might distrust the flattery, at least I do. To me it's as if they don't really know me, if they did they'd have a more balanced view. Equally a person can have a totally jaundiced and negative view of me that I would be inclined to reject as accurate, simply because it'd be too awful to contemplate, and hopefully is inaccurate in its extremes. Carrie is a wonderful poet, Jim. Thanks for posting these here. Even though you say they're poems and therefore untrustworthy, I'd say Carrie's poems, and most poetry worth reading, have an authenticity about them that brings us as readers closer to our emotional experience and therefore it's probably more trustworthy than so called non-fiction. It's funny how gregarious you are within the blogosphere, Jim and yet here you go again describing yourself as quite the recluse. I believe you, of course. I'm not familiar with Griffins. I can see them in my mind's eye through some place like Lewis Carroll's Alice in Wonderland, but maybe that's a gryphon. I've googled the word just now and see a griffin to be a mythical creature half lion, half eagle. I thought they might have been real. You learn new things all the time in the blogosphere, Jim. I'm curious about the griffin story because I imagined the three of you sitting side by side or across from one another without speaking, each in their own cocoon. Is this what you meant? You do well to admit to nothing, Robert, when the police interrogate you, especially when they try to put words in your mouth, which is the way of most concocted confessions, I imagine. I take it you did not enjoy the police transcript of your alleged misbehaviour, Robert. It didn't come across to you as you, not as you saw yourself then perhaps. It's hard to get it right, but I suspect their agenda was not the same as yours. Now that's a thorny one, Robert. To me the notion of 'truth', Laoch, is one of the thorniest issues of all. Somehow we are always looking for it and can only ever glimpse at it. If we think we have found it then I suspect we are in trouble, but at the same time we keep on searching. I like to think of truthfulness and authenticity as more gentle ways of describing that which we need but can never grasp except in passing. And yet, as I said earlier, we need it. Without some effort to arrive at some sort of truthfulness and authenticity we are in trouble. Perhaps it's related to the notion of finding meaning in our lives and then of course meaning-making can vary so greatly for all of us. As well, it seems there are some universals in the human experience but they need not be seen in absolutes. I'm glad you've found something to reflect on here, Rosaria. Thanks. I agree MF, imagination is a reality, however non-tangible might seem to some. Imagination can save lives and it can also bring on wars. Thanks MF. As i've just now said on your blog, your thesis sounds intriguing. It put me in mind of one of Alastair Macleod's short story, The Boat, in which a young man reflects back on his father who has died by drowning. If you haven't read it yet, you might find it an inspirational read. I suspect Jung would, were he alive today. No raised eyebrows in the writing about you, Robert. Perhaps it's not surprising, given your skepticism. And thanks for the reminder that cats are predators after all, however much we might want to domesticate them into sweet and friendly, warm and loving creatures. It's not for no reason that we lock ours in at night. How wonderful, Erin, to be born over and over again. Or is it? To re-experience the trauma of birth and all that follows. I'm not so sure. I agree with you though: to be written about is to see a new view of yourself, and even to write about yourself is to perceive yet another view magnified by as many readers as your are lucky to find. Identity is so multiple and fluid, Erin. Aren't we fortunate in this? How boring were it otherwise. Your wonderful blog posts, lay you open to amazing caricatures, Kath, but how you are in so-called 'real life' is anybody's guess. Maybe one day we bloggers could try to write a profile on one another and see what transpires. We'd create a vast variety of fictions, I imagine. Your story is evidence I reckon, Susan, of how things change. It must have been tough to read your ex-husband's account of you and your son back then, especially given as you say that he's such a good writer. It's easy to dismiss poor writing about you, but good writing, that's another matter. I'm glad you were able to make use of the experience yourself in your creative work, Susan. As far as I'm concerned that's a useful way of overcoming the pain of such betrayals: weave them into your own life collage. Thanks, I got that short story by Alistair Mc Leod on-line. Hopefully your life will return to so-called normal soon, Kay. I'm glad you haven't suffered the indignity of being written about yet, but then again you might also have missed out on some of the pleasure of trying to find yourself between someone else's lines. The problem is that you need to qualify the word ‘authenticity’ with the indefinite article ‘an’: there is an authenticity to these poems but not necessarily an accuracy. Here we come down to the definition of a poem as an event in itself and not a recording of an event; at best it can only be an evocation of an event but, more often than I suspect people would believe, it is nothing more than a work of fiction even if it does set its action in the real world. In ‘A Room Called House’ for example I have no recollection lying spread-eagled on the floor nor can I imagine Carrie doing so. For starters it’s a fairly small room and as it remained furnished until after we had left – house clearers came in and emptied it – there probably wasn’t the space to lie on the floor. I have no idea if the floorboards were oak. Since it was a Council house I somehow doubt it besides they were covered up by a wall-to-wall carpet so, again, this is poetic licence on Carrie’s part. I would even doubt that the room smelled of wax. In her last years my mother wasn’t the most house-proud of women. Yes, the place was always clean and tidy but I don’t recall anyone polishing anything in the house after the nineteen seventies. Let me reiterate though, I am not a gregarious person not by any stretch of the imagination. I’m simply aware that that is how one gets known online and so I make an effort and it is an effort. That doesn’t mean I’ve not developed friendships online because I have but I never went looking for them any more than I was looking for a wife when I first made contact with Carrie online all those years ago. My logic was that as long as I kept in contact with women on the other side of the world I’d be safe. I’m not saying I’m unhappy that I met her but I really wasn’t looking for her. And much the same happened with the blog, suddenly people started commenting. I knew there was a comments box and that I might get the occasional, “Great post,” but the degree of interaction was not something I was prepared for. As regards the griffin story, no, we weren’t sitting side by side like stone statues, far from it. My daughter was welcomed into the home by Carrie and has always been treated like her own daughter. The first thing Carrie said to me when she heard I was meeting my daughter for lunch last week was to tell her she loved her. And it wasn’t something like, “Pass on my love,” it was, “Tell her I love her.” And I have no doubt that the feeling is reciprocated. But back then the simple fact was there were two women vying for my affections and I was conflicted. I didn’t expect my daughter to turn up on my doorstep but these things happen and you deal with them. We survived. The griffens did not. I hope you enjoy the story, Michelle. I've written about other people on my blog, and several of them have read it. All but one was delighted, and that one simply requested that I go back and conceal their identity better. I have no idea why I put myself in a position of needing to be told to do such a thing, but I hadn't even remembered that I had given so many recognizable details. It was a slip that makes me cringe every time I think about it, so I usually don't. You have such a way with words, Jim, perhaps you can give my talk for me. I find it hard to stay on track. I think I'm supposed to focus on the degree to which the autobiographical is fictional or not, but I keep getting back to notions of truth and truthfulness, and the degree to which 'an' authenticity applies. I've found some wonderful quotes from a variety of writers to support my argument that : All creative writing, not written as a statement of fact as in strict journalism – which in itself can sometimes seem fictional given the subjectivity and spin of its narrator, the reporter – is to some degree fictional. I prefer to use storytelling in my talks but it's so easy in storytelling to get off the point, and yet anything else might become boring. You are fortunate to have found someone like Carrie. Her generosity shines between the lines. I like my people generous. I do not admire stinginess or meanness of spirit however much I might struggle with it in myself at times. As for the surprises that crop up in the blogosphere, you were one of my first ever surprises. Your generosity in taking me under your wing as it were when I was new at blogging and almost too terrified to put a foot wrong. These days I have much more confidence in blogland as you can imagine, but much of it started with you. I see along the way that you support others in this way, too. What's that old saying, from the bible I suspect: you reap what you sow. People often use it to refer to the negative, but it can equally apply to the positive. What interests me is the notion that we are 'that' person, all these years later. And we do that to others, brand them with a label; boss, liar, stoner, whatever. Your wedding photo is so beautiful…and neither of you are those young hopefuls now. We're fluid and changeable and as they say in Zen-form is emptiness, emptiness is form. So stories about us are always fiction, as you posted. Fascinating post. I love your writing, the way you brought in the scene with your cat at the end, all of it. To my knowledge I have not been written about, other than a few poems and one song. But that is different than being fictionalized, something I actually never considered until reading this. I'll be thinking about it for days. Without going back to see if you have already mentioned this…. After leaving my previous comment I signed off Blogger and went to my Facebook page, where I found a post by one of my blogging/fb friends that her blog–along with those of two others I read regularly–were listed in the Top 50 Memoir Blogs list. I went to the site and…..your blog is there as #4! It's easy to slip up like that Snow, easy to include too many details that might then offend. I fear I do it too from time to time. It's not so tough if we take the view that it is fictional to some extent. But in so far as much of what we write is based on our experience on the so-called truth of our experience, it's easy enough for people to call us on this and say either it was not like that for me and I was there too or to say you've breached my privacy. In any case, it's not easy and the ensuing conflict can be down right painful. Thanks, Snow. It's good to see you here again and I must travel back to you. It's been as much as I can manage these days keeping up my own blog. I have been much less out visiting lately but I will improve. I agree Beth, that young hopeful couple in my wedding photograph is no longer the couple that exists today. we keep on changing. I suppose there is a connecting thread though, between the us then and the us now, that binds us together but anything we write about that us then and the we now tends to the fictional. It shifts as soon as it hits the page. Thanks Beth. It's lovely to see you here. It is a scary thought, isn't it Lydia to be written about? To find yourself in someone else's pages and then to wonder is that really me? It's happened to me a few times. It both tickles my fancy and unsettles me. In one situation the me that was described was a version of me from many many years ago. I almost did not recognise myself, but given that the writer did not deny her description of me, which she had tried to disguise by turning me into a man, I'm still fairly sure it was an old version of me. This is a bit cryptic I realise but here I am protecting identities myself. We do it all the time. Thanks too, Lydia for your congratulations. I'm chuffed. I intend to put up a post about it, as soon as I can. Maybe even this morning if I can find the time. Elisabeth, it's often tempting to "spice up the truth." For example, in my latest post, I mentioned that my father had been married five times. Later, I wondered if the right number was four. I couldn't remember, so I used the less powerful word "several." I hated to though. I know the temptation to 'spice things up', Snow, but it may also be out of a need to respect the emotional truth of a story. Sometimes the so-called facts are not as important as the emotional meaning. Not so much as an invention but as part of the composition that aims to offer the reader some of the impact of a experience. I have been fictionalised all too often in real life – I'm not sure I want to discover myself on the page of anyone else, though I write about myself lots. I also write about my husband and he does tell me/reassure me he sees the fictional distinct from our real lives. I should take a lesson from him there. Your photograph is beautiful, btw. Excellent post. I had some personal experiences handed down to a character in a novel once. I knew the author (a friend) was going to use them but was still shocked to see them in print. They were very intimate, personal experiences. It was very strange. The book became a movie but the experience was left out. No one would ever have known it was me so it didn't bother me in the least. I'm getting better at doing what your husband does, Rachel, seeing the fictional as distinct from the real in our lives. I call it not letting myself take things too personally. When we take things personally we operate as though there is only one truth and it feels like there's been an attack on us as a singular being. But life is usually more complex than this. When we can distance ourselves a little without losing touch with how we feel we can often learn more from an experience, at least that's my take on it, however convoluted. But imagine, Catherine from a thousand clapping hands, what if they had used the experience from your life in the movie? I suspect it's one thing to be written about – imagination brings much to bear here – but to see yourself as someone else imagines you rendered in film form, wow. Of course the same principles apply. It's all fictional at some level and so you need not be bothered. I had to look up the definition for "chuffed" after reading your reply to my comment, Elisabeth. Interesting word!